Homosalate (12%), Octisalate (5%), Avobenzone 3%, Octocrylene (2.7%). Water (Aqua), Glycerin, C12 15 Alkyl Benzoate, Silica, Pentylene Glycol, Tocopheryl Acetate, Panthenol, Cetearyl Alcohol, Steareth 21, Steareth 2, Arachidyl Alcohol, Polyacrylamide, Caprylyl Glycol, Behenyl Alcohol, C13 14 Isoparaffin, Disodium EDTA, Xanthan Gum, Cetearyl Glucoside, Arachidyl Glucoside, Allantoin, Bisabolol, Laureth 7, Triethanolamine, Methylisothiazolinone, Phenoxyethanol. Good for acne prone skin available at target! 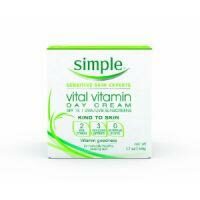 my favorite store doesn't moisturize all day long I love waking up and putting this moisturizer on. My makeup goes on so nicely after applying. I put it on and wait about 5-10 minutes and apply my primer and foundation. Half way through the day my skin starts to loose a little bit of the moisture. If i have a dry patch it will look a tad flakey. I think this is a great moisturizer but i wish it was a little bit more moisturizing on my skin. Simple is a great product line for my skin because i'm looking for a basic skin care product with no additional additives and I think i may have found it with this line. Helps with peeling Makes some parts of skin smooth Stings my sensitive skin Doesn't work well on chin with perscrition acne gel I use this product in the morning, spot treatment through the day(if needed), and at night combined with Veltin Gel. My chin and around my mouth is always peeling and it sometimes helps. Doesn't affect acne Makes skin soft and smooth Fairly cheap for a moisturizer Has SPF for sun exposure Makes skin sort of oily I love this product. It's so hard to find a good moisturizer that is fragrance free, has SPF, and makes my skin soft. I have combination skin, so an oily t zone and dry cheecks, and it makes my skin soft but leaves it somewhat oily. I still love this product though.